I love iced coffee. Morning, afternoon, evening. Through summer AND winter (and yes, I live in upstate New York where winter could be -10 degrees). I love it black, or with cream and sugar. I love it flavored (except hazelnut), but I love it MOST when I make it at home and save myself $2+ every day. Someone explain to me why iced coffee costs more than hot coffee???? I found this recipe that I love, to make it at home. However, it makes a very large batch (a gallon), and for just me, that’s a lot! Especially since after 2pm I’ll drink decaf so I can sleep! So now, I brew my coffee differently, which I’ll show you in a second, but I use her “sweet cream” recipe to sweeten my coffee. If you’ve ever had Thai Iced Tea, it’s the same stuff they use to sweeten that. Oh, and did I mention I also LOVE thai iced tea and make that at home too? Now.. On to the coffee. This Bodum Iced Coffee French Press is the perfect thing. I got mine from amazon for $69.00. While this is steep, this thing lasts forever, and is easy to clean, and the perfect size for my fridge. So what I do: fill up the container with water, add approx. 6Tbs of coarse-ground coffee (I usually do 6 heaping spoonfuls because I like it strong). Then you stir it all up, and put the lid on (the one you see leaning on the pitcher in the above picture). Leave it in your fridge overnight. In the morning, you take off that lid, and put on the one seen in the picture, and press the plunger down (french press). There’s a nice button to push that opens up the pour spout. Now, usually I have a batch in a pitcher in the fridge and a batch in this – one regular, one decaf. All you have to do now is get out your favorite glass, fill it with ice, and pour your cold iced coffee over it. If you want to add the sweet cream do that too! 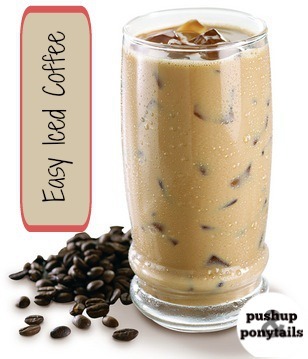 Another idea is to add chocolate syrup, and make your own iced mocha!